Slightly bolder lines, and a slightly more dog-like look, including the tongue. 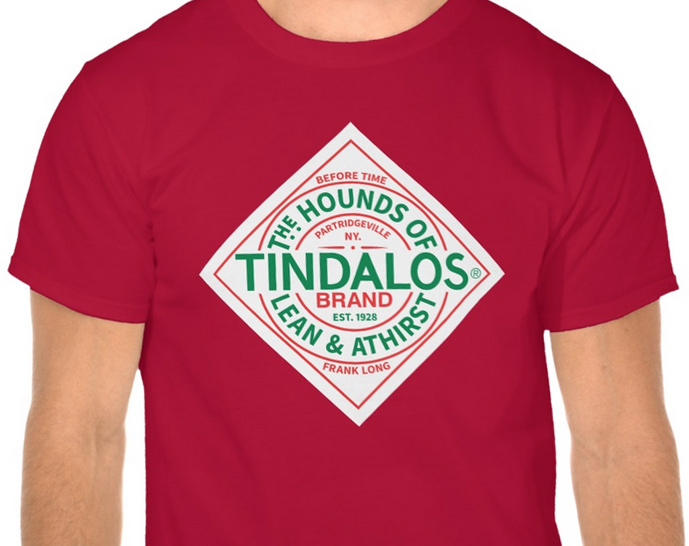 For Sale: The Hounds of Tindalos / Tabasco Sauce Logo Parody! Also available on the budget white tee, and all the other dak tees, including a couple shades of green, if you prefer the green sauce. Also also available as stickers and pins. And, I stuck “NY” on there because Long was born there, and he never specified where Partridgeville was. Others have placed it in Massachusetts after the fact, I think. 1928 is the date of the events in the story. Author Staff WriterPosted on September 21, 2015 Categories Design, Physical ObjectTags Advertisement, FBL, Frank Belknap Long, Hounds of Tindalos, HPL, Humor, Lovecraft, Pin, Shirt, Silliness, Tabasco Sauce, Tindalos, ZazzleLeave a comment on For Sale: The Hounds of Tindalos / Tabasco Sauce Logo Parody!